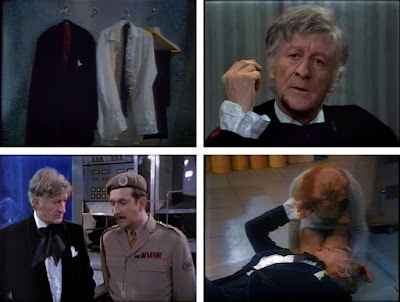 Before fabric cutting on my Inverness Cape, I thought I’d take a little look at the costumes worn by Jon Pertwee in his time as The Doctor. 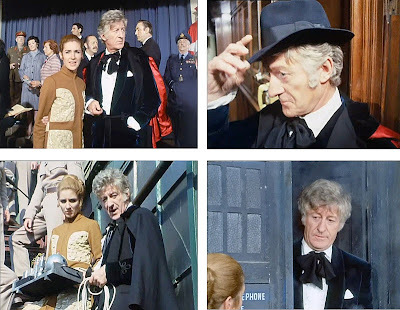 I had been watching a number of his later episodes and noticed he seemed to wear a different smoking jacket or Inverness Cape for each story. I had also noted that for his earlier stories he wore the same thing for every adventure. So when and how did this transition happen? Who better to get in to take a look? Trine-E and Zu-Zana obviously! 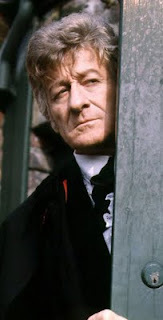 Yes Doctor – you may hide – but they will find you! 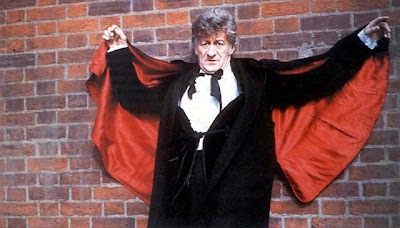 Jon Pertwee’s costume is established in episode one as being stolen from a surgeon at the hospital. He wears black trousers; white button-fronted frilly shirt with conservative sized lapels; black silk cravat; midnight blue rolled-collar smoking jacket with a single frog-fastening, a handkerchief in the breast pocket; and a red silk lined, button-fronted black Inverness Cape; plus occasionally a black fedora hat. 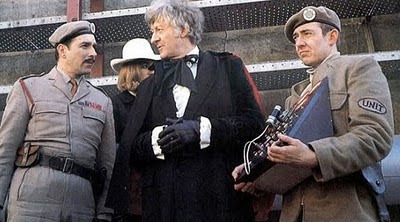 The doctor wears the same costume as in Spearhead From Space. 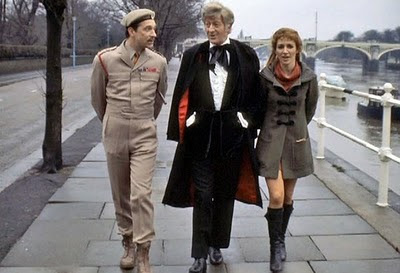 The doctor continues to wear the same costume as in Spearhead From Space. So overall a fairly simple costume of black and midnight blue, with little or no variation from episode to episode. But black is so last year and that cravat! Let’s hope he can follow the rules, and do better next time . . .
Whilst watching 'Inferno', I did notice several other parts of the costume. A pair of black clip suspenders can be seen when he is imprisoned, as well as the use of black gloves when going outdoors. Finally, I noticed that his Sonic Screwdriver is stuck next to the handkerchief in his breast pocket. There's a scene in "Spearhead from Space" where even the smoking jacket is shown to have a red lining.